Fife Flyers hosted the Coventry Blaze on Saturday night looking to rebuild their confidence on home ice following last Saturday’s heavy 8-3 reverse at the hands of the Cardiff Devils. Fife started in explosive fashion, and Carlo Finucci opened the scoring after Blaze netminder Miroslav Kopriva appeared to drop the former’s wrist shot over the line at 3.24. Kopriva had to be alert to make a glove save from Finucci barely a minute later, but momentum was halted following a serious injury to Coventry’s Jake Hansen after an awkward landing against the boards, he was escorted from the ice by the doctor in a wheelchair to warm applause from everyone inside the arena. Blaze were on level terms at 14.04 through a powerplay goal, when Luke Ferrara finished high past Shane Owen just as the Flyers were returning to full-strength. The home side thought they had taken the lead after a scramble in front of the Blaze net, but after further review, the officials washed out the goal due to man in the crease to the consternation of the home support. Flyers began the second period much the brighter side, and they took a deserved lead with a powerplay goal on 27.03 when Evan Bloodoff dispatched Finucci’s pinpoint pass at the back post. Eighteen seconds later, Fife gave themselves a two-goal cushion when Jordan Buesa finished off a sweeping move, wristing neatly beyond Kopriva at 27.21. Blaze had to get themselves back in this game, and they almost did when Owen made a miraculous pad save to deny Alex Nikiforuk who was left all alone in front of the Fife net with the defence posted missing. 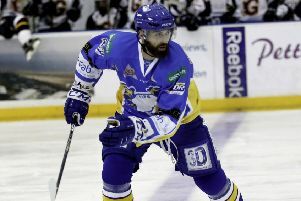 Fife then added a fourth goal when defenceman Ricky Birzins barged his way past the Coventry defence and hammered high into the net from Marcus Basara’s smart centre at 33.38. Flyers defencemen Rick Pinkston was penalised for a slash and an unnecessary cross-check on Coventry’s Ben Lake before being adding roughing to his charge-sheet with less than a minute remaining in the period to give some faint hope to the away side going into the final stanza. Blaze began period three with just over three minutes on the powerplay, but were unable to break through a robust home defence, and that seemed to sap any belief out of the visitors', although the shaky Fife blue line did cough up some good opportunities for Blaze which could have been punished. Blaze did score a second goal when Lake fired low past Owen on a delayed penalty call to reduce the arrears on 53.08, and were only denied a quick-fire third thanks to the combination of the post and Owen sprawling to stop the loose puck from trickling over the line. Coventry called a time-out with just over two minutes remaining, with Kopriva pulled and the clock running down, a scramble behind Owen’s net led to Flyers putting the icing on the cake when Evan Stoflet fired into the empty net on 58.26 to seal victory for the hosts and earn their second win in succession. Flyers boss Todd Dutiaume was happy to see his team return to winning ways on home ice and to see maximum effort from his players. “It was important for the people who come to see us, week-in and week-out to see a Flyers team rolling, and control large parts of the game,” he reflected. “We were far from perfect, there were times there was a man unchecked in front of our net, I was displeased with that,” he added. Fife head to bottom side MK Lightning tonight but Dutes warned his players not to take anything for granted in their quest for a four-point weekend. “You can’t look at the standings and assume it’s going to be an easy night, absolutely not,” he stressed. “It's a building we are certainly going to have to be at our best in to get the points." Flyers entertain Guildford Flames next Saturday. Face-off 7.15 p.m.